Karachi is a HUGE city! And when I stress on the word huge, I mean to emphasize on the point that every day many new businesses are launching, new restaurants open up, new schools come into action, new shops are launched. But due to great distances, people often living in one part of the city, miss out on the good stuff on the other side. However, some ventures are just too good to be missed, and I would recommend making that extra effort to actually go and visit it. Lucky One Mall is definitely one of them. It’s very new, just around a year since its launch and people can’t help raving about it. Of course, the launch was pretty grand with celebrities and musical shows etc, and the following days were a bombardment of people flocking in. I also heard that on the first day of opening, people were lined up for hours! I am not judging people here, usually many Karachiites want to see its city progress and reach new heights, and its very hard to wait to explore something new. However, I waited for a few weeks due to time availability. I went there with my kids and parents. If you are going from Nazimabad or Sakhi Hassan take the overhead bridge (Nagan Bridge) and you will reach there in just 15 minutes without getting stuck in traffic but if you take the Ayesha Manzil route from the UBL complex you will get caught in traffic. Since all these areas are also connected to distant areas such as Tariq road, Clifton, PECHS you may choose whatever route suits you. I clearly remember that before Lucky One Mall was constructed this site was allocated for the construction of an apartment building complex, but somehow the apartment building was converted into a mega-mall. 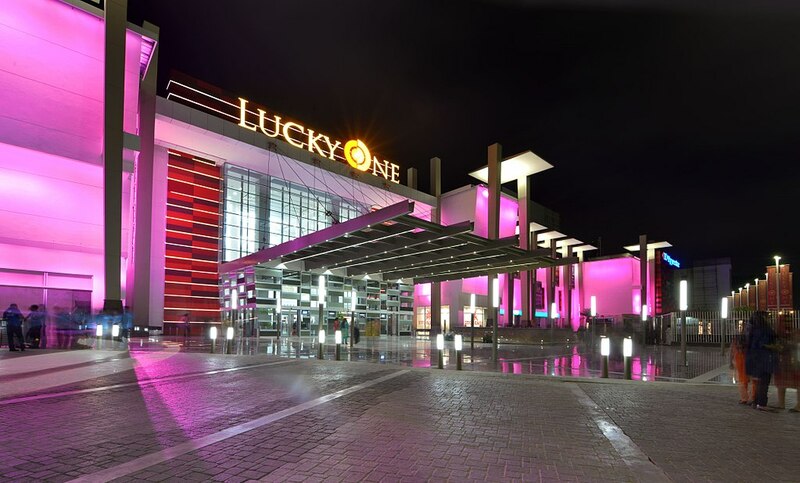 Now the location of Lucky One mall is pretty central, because its connected to Gulshan, Gulistane Johar, Hasan Square and Ayesha Manzil. When you enter the mall, you will be quite impressed by the huge entrance and the parking facilities. I must admit the first impression that you get when you look at the mall, is that it looks nice but it won’t be that huge. False. The entrance view doesn’t give the exact insight of the mall, as soon as you would enter the mall you are guaranteed to be awe-stricken because this mall is grand and glittering. With all the national and many international brands, Lucky One Mall is pretty much state of the art. Some people compare it with malls in Dubai, others believe it’s a competitor to Dolmen City Mall. I say its another wonderful shopping mall in Karachi which provides the experience and facilities to its best. Also when it comes to our national brands such as Sapphire, Khaadi, Ethnic their stores in Lucky One Mall is bigger as compared to other malls, also the interior designing is extremely beautiful. If you’ve been to big stores in New York City, you can make a connection of the way the products are displayed in exquisite glass boxes, which adds to the brand value. Also Sapphire has Sapphire Men collection there which I did not see in any other mall. Another personal favorite it Ethnic, they had a huge collection of clothes. Many designs which I did not see in Dolmen City mall I was able to get them easily there. Ask for any brand and you are sure to find it there. The only problem that I had there was in spotting the elevators, which are not in the front but you have to walk a distance to reach to them. Since I’m with little kids, I’m hesitant in using escalators. The toddlers’ soft play area is really nice with many hands-on activities. Its very clean and the staff is very friendly they are never rude. And its very cost effective. When visiting the first time you have to purchase a card worth Rs.1000 and then use this card for the rides. I have used one card in two trips and my kids had their fill of adventure. Onderland is also Karachi’s first indoor theme park with a roller coaster. But the best part about Onderland is their party room. It is new, it’s spacious and it’s very clean. Earlier there was a party room in Sindbad Dolmen City Mall too, which I believe was a very good option for celebrating kids birthdays, but ever since that closed down, people celebrate birthdays in the open food court, which does not provide privacy. 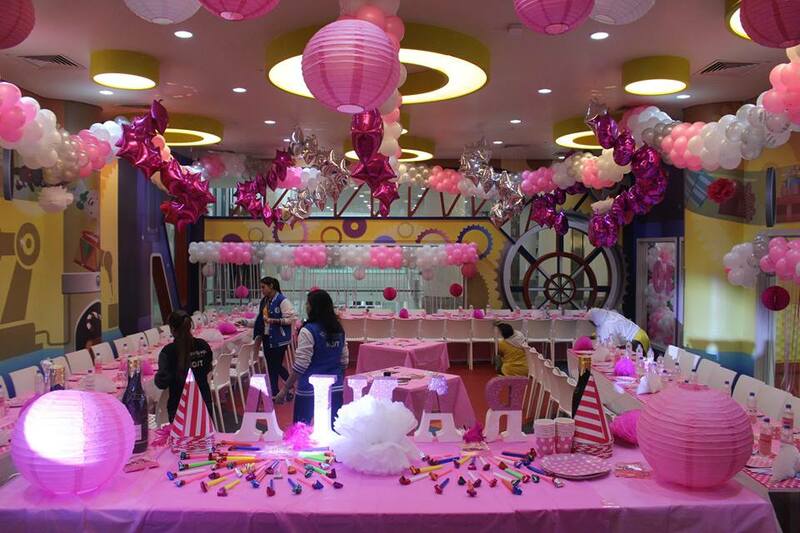 So the only and really attractive birthday party room that I see available in Karachi is the party room in Onderland. As you stroll through the levels of Lucky One mall you will also discover many new brands, which are worth a look. But when it comes to the food court I don’t find it equal to the overall magnitude of Lucky One Mall. It looks smaller and definitely needs more food ventures. However, you will find a lot of U.K based food brands like Dixie Chicken and London Fries. I have tried Dixie Chicken the taste is average, though the price is same as KFC. My suggestion would be if planning to eat from there, first take a good look at everything that’s around, then decide and preferably go with the brands you already know. Lastly but not the least, do check out the Hyperstar there. It’s very neat and huge. I like their arrangement and it resembles the Carrefour setting in Paris. Lucky One Mall, is a must visit for every Karachiite as there is lots to explore and having fun!